Hojo-Undo is a collective term for supplementary training in Goju-Ryu. There are several different types of traditional equipment that can trace their roots right back into ancient Chinese martial arts. Today, the most commonly used are the Makiwara, the Chi-ishi, the Ishi-sashi, the Nigiri Game, the Kongoken and the Tan. The makiwara is most commonly used by the more serious karate-ka. A traditional makawara is made from a tapered piece of wood with a rice straw cover for striking although today we mostly use a leather cover. If you do not have access to a fixed makiwara then modern focus pads may be used. Although focus pads were designed for another purpose, they will still improve timing and distance whilst moving. The visible signs of makawara training are callused knuckles and hands, although the main idea is to strengthen the wrist, elbow and shoulder joints to improve focus and power in striking techniques. 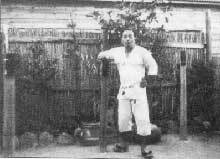 Makiwara training should be built up over a period of months before full power is used. The chi-ishi literally means "strength stone". Its origins are thought to have come from China, though it is widely used in Okinawa. The chi-ishi consists of a stone weight with a long wooden handle. The length of the handle is determined by either of the following. In an upright position the top of the handle should come up to the knee joint, also if the user hold the chi-ishi at both ends of the handle the hands should be able to go to the side of the body as in basic punching. There are many exercises with chi-ishi for strengthening the grip, shoulders and arms. It can also be used to condition the forearms by performing Kakie like exercises. The ishi-sashi is based on a stone padlock formally used in China and Okinawa and its uses are very similar to modern dumb bells. Being more stable in design the ishi-sashi can be used also with the foot to develop the muscles and tendons we use in kicking techniques. Most of the blocking and striking techniques with the arms can be performed with the ishi-sashi. This helps to develop strong shoulder and back muscles and increase ones kime (focus). A modern version of the ishi-sashi can be made from metal hence the name tetsu-sashi. Nigiri game (pronounced "nee-ghee-ree gam-ay") translates as gripping jars. They are specifically designed to develop the strong finger grips needed to execute many of the advanced blocking and holding techniques used in Goju-Ryu. They also help to improve the posture and endurance in certain stances. The jars are generally cylindrical in design with the width of the upper rim being the width of the user´s grip from the tips of the fingers to the inside of the thumb joint. We also have a metal version of the nigiri game. The kongoken is unique to Okinawan Goju-Ryu and was based on a steel ring used by Hawaiian wrestlers. After seeing this in Hawaii, Miyagi Chojun Sensei on his return to Okinawa decided to develop a similar piece of equipment changing the shape to oval. The oval shaped kongoken better represented the shape of the human body and a greater number of exercises may be employed. The kongoken can weigh from 30 Kgs upwards depending on the user. Care must be taken if the kongoken is too heavy. Exercises may be performed with a partner or alone. The kongoken helps us to achieve power in the hips and legs and also helps with developing the strength and co-ordination required to perform throwing techniques. The tan or barbell, unlike modern barbells made from metal, has a wooden bar to grip and either stone or metal weights at each end. Along with the more well known exercises that can be performed the tan is used in several unique ways. The most popular is to stand in sanchin dachi with the arms in morote chudan nukite kamae, the Tan is then balanced on the upper arm where it is rolled down the arms until it reaches the wrist when it is thrown into the air and caught on the upper arms in the starting position and the exercise is repeated. This not only conditions the arms for blocking and striking but also develops the trapesius muscles at the back of the neck and shoulders. These muscles help in the performance of sanchin kata.